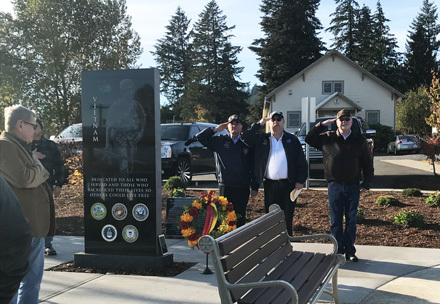 On September 21, 2018 Chapter 392 participated at the dedication ceremony for the Vietnam War Memorial in Boring, Oregon. It was a beautiful late summer day as the crowd gathered at Boring Station Trailhead Park for the ceremony. This memorial honors the 41 servicemen from Clackamas County, Oregon who lost their lives in Vietnam. Chapter 392 was a co-sponsor of the memorial. As part of the ceremony, we presented Vietnam 50th Anniversary commemorative pins and certificates to 30 veterans in the audience. 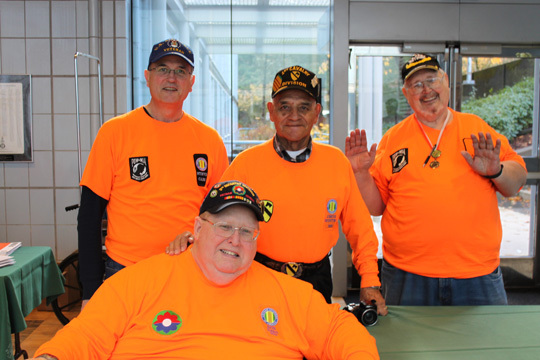 On November 11, 2018 Chapter 392 revisited the memorial to honor area veterans. We laid a wreath at the memorial and saluted the fallen with a Taps salute and gave out 50th anniversary pins to local Vietnam era veterans. Photo of Taps ceremony on Veterans Day at the Boring Memorial. At the left is Steve Bates, the head of the group behind the memorial. Saluting at the right are Chapter officers Steve Carr, Larry Cranford and Dudley Redhead. 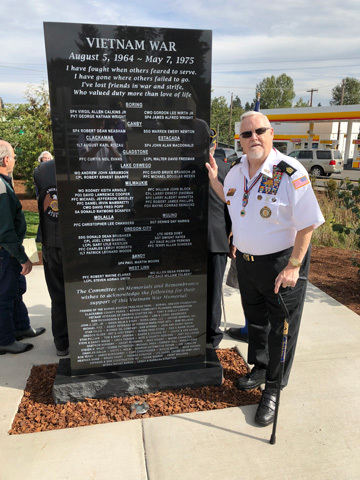 Former Chapter President Gary McAdams poses in front of the new Vietnam War memorial in Canby at the dedication ceremony. VVA Chapter 392 is proud to be a commemorative partner in this program. 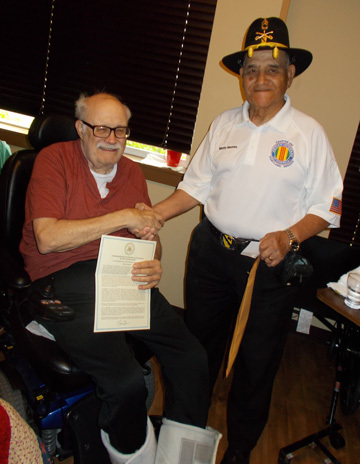 VVA 392 Board member Jesus Montes presents the Vietnam 50th Anniversary pin and certificate to chapter member Boyd Yaden at the Oregon Veterans home in Lebanon. There was a great turnout for the town hall. 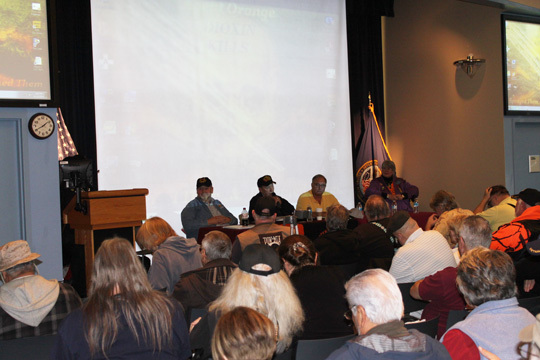 The auditorium was packed with 130 attendees.